Marvel's Hulk reboot delivers plenty of Hulk-based action and several fan-pleasing moments, though it's let down by an underwritten script. Ditching the events of Ang Lee's Hulk and zipping through the back-story in an impressive credits sequence, The Incredible Hulk picks up the story with scientist Bruce Banner (Edward Norton) on the run from the military and hiding out in Brazil. 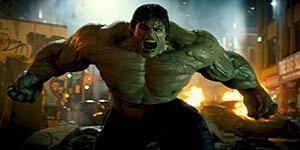 Banner spends his time learning anger-controlling techniques while desperately searching for a cure to the gamma radiation poisoning that turns him into the powerful green creature known as the Hulk. Meanwhile, General Ross (William Hurt) obsessively searches for Banner, hoping to capture him and harness the Hulk's power for military purposes. However, when mercenary commando Emil Blonsky (Tim Roth) volunteers to be turned into a super-soldier, Ross unwittingly unleashes a creature known as the Abomination and the Hulk is the only one who can stop him. It's probably fair to say that this is the movie that Hulk fans have been waiting for, as there are several terrific set-pieces (e.g. the Hulk using two halves of a police car as boxing gloves) and a bewildering array of cameos, both of real people (Stan Lee, Lou Ferrigno, even Bill Bixby) and fictional characters from both the Marvel Universe (Robert Downey Jr pops up as Tony Stark, a future Hulk villain is introduced) and the TV show (a reporter named Jack McGee). Norton is fine and there's strong support from Hurt, while Tim Blake Nelson provides some pleasingly off-the-wall moments as a fellow scientist trying to cure Bruce. Unfortunately, the film is often let down by a frustratingly underwritten script that bungles its emotional scenes and includes several jokes that fall embarrassingly flat. Similarly, it leaves Liv Tyler (as Betty Ross) with almost nothing to do except occasionally stroke the Hulk or stare at him with a sad expression. For the most part, The Incredible Hulk is a lot of fun and Hulk fans won't be disappointed, but it's not as good as Iron Man.